For such a young whisky quite interesting and complex, but whether he really stands out among its competitors in the price range 40-50 euros, I put it in the room. 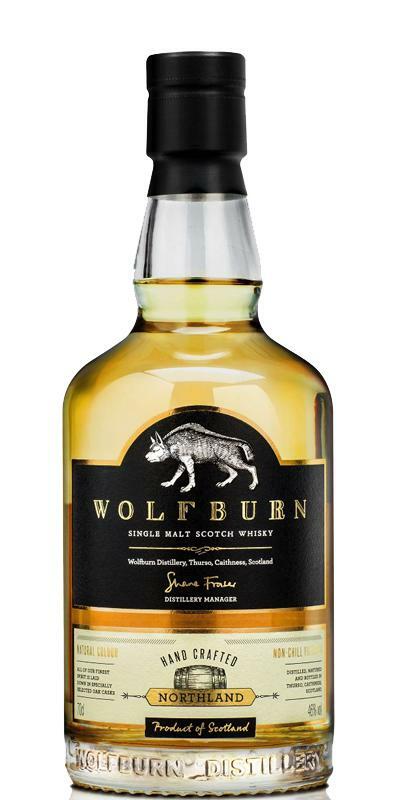 I'm curious if in a few years, the longer matured Wolfburns come out, where then the way goes. That they want to open the way to the top league openly, that can already be guessed, you should give every few years a chance to follow the path. Very pleasant, which has matured at Wolfburn in just 3 years. That definitely makes you want more. The only unpleasant I felt the woody notes that came through in the departure, they were irritating and had something rather cardboardy. Otherwise, the departure is very interesting, overall, it comes here less to a sensory overload as we know from other short maturations, but everything comes staggered therefore. Fresh and slightly fruity. Not much is yet to come. Mild and fruity-sweet, honey, floral, nut and white chocolate. Quite consistent. Slight sharpness in the medium-long to long finish, very slight hint of smoke. After a while, the chocolate comes again, but this time a touch. At the very end, the wood comes through too, but unfortunately it is less pleasant, more sticky than oaky. It hides it youth well - the mature bottling ought to be interesting. The nose is chocolate, raisins and fruit cake with some smoke coming through as well. Unusual in that the liquor is quite soft as first, but then the bite kicks in - similar to a Caol Ila. A lingering warmth - pleasant.